In Chaos Heroes Online, players fight against each other in team-based 5v5 PVP matches, choosing from a wide selection of heroes in a classic base attack MOBA MMO. The game originated in Korea, an evolution from the early Warcraft DotA map that spawned DotA Allstars (which ultimately became DotA 2) and DotA Chaos, which lead to the creation of Chaos Heroes Online. With a huge following in Asia, both the Korean and Chinese market in particular, the game is now set to be released in Europe and promises to bring a new pace to the MOBA genre. Chaos Heroes Online offers a number of small but game-changing differences to many of the other MOBA games on the market, sticking to the more traditional roots of the original Warcraft mod, players still get the classic challenging gameplay but with a few added extras. The basic premise is for players to group up in two teams of five and fight over a single large-scale map with the ultimate objective of destroying the enemy base, to do this they must fight past enemy sentry towers, waves of minions and, of course, other players. The game has a huge choice of heroes, all of which will be available for the European published version, with an expected 60+ heroes that players can choose from with plans to add more every few weeks. The full roster of heroes is broken down into two primary factions, each of which divides the heroes into their primary stat (Strength, Agility or Intelligence) to determine their primary role and what type of abilities they have. Each hero has unique skills and attacks that they can perform during the battle and players are offered customisation variations with a number of skins available. The game will feature a number of classic combat modes for players to choose from, including the 5v5 team based game, a team coop 5 v AI team where players can go up against the advanced AI enemies, and also a single player 5 v 5 where the player fights against an AI team with 4 AI allies on their own side. Players will also have the ability to customise their own games, choosing how many players or AI bots will make up the teams. 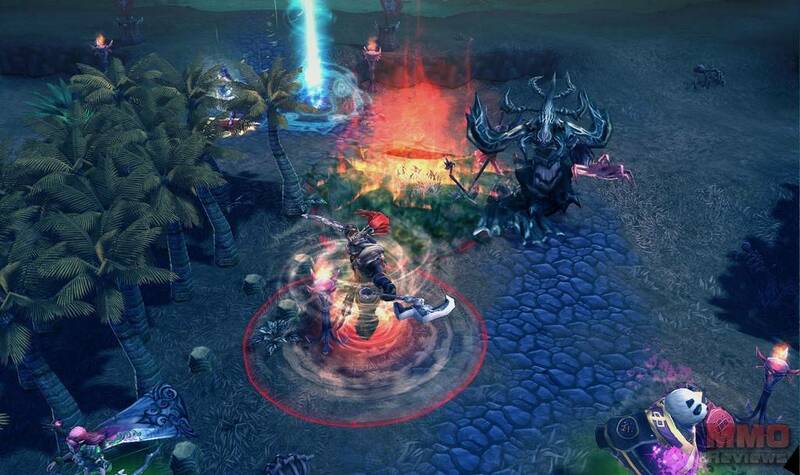 The game offers a classic three-lane map, though on a larger scale than some other MOBA games, with three lanes connecting the two bases. In between lanes, players can find jungle areas which hide all manner of enemy camps, but interestingly players are able to cut down jungle to create their own mini-paths. With such a large map, players are able to use the two teleporters to switch between the two outside lanes, though they are only able to this twice in a match. Interestingly unlike DotA and League of Legends, players fight from top left to bottom right and vice versa as opposed to bottom left to top right, which in itself should feel completely new to any veterans to the genre. Some of the key differences in Chaos Heroes Online are first and foremost that matches have a time limit of 50 minutes, meaning players only have a finite amount of time to do achieve victory before the game ends and the win goes to the team with the most points, meaning a constant rush of combat. Also, players are able to purchase item upgrades whilst they are still in the field, as well as all manner of consumables, meaning they don’t have to keep returning back to base and can stay in the thick of combat instead. The skill level required for the game is definitely not for the more casual player and those players who are skilled and have quick reactions can create some incredible plays by quickly casting abilities, countering them with consumables and even double countering to create some fast and impressive gameplay.